Whatever your reason for building a treehouse, it must be strong and safe. You need the right tree and capable materials. The house must allow the tree to move in the wind and to grow with minimal restriction. Almost any mature tree can be used for a treehouse and it doesn't have to be expensive, you just need some good ideas and the motivation to make it happen. Follow these techniques and tutorials to start your build confidently and avoid costly mistakes. From tiny shacks made with driftwood beside a river, to treetop observatories and towering cathedrals spanning several trees, the range of designs and styles of houses built in trees is breathtaking. A connection with nature and use of reclaimed or salvaged materials can inspire an environmentally sensitive process of building. Many of these structures are built as a temporary escape from the rat race and the pressure of busy lives and can be fitted out with beds, wood burning stoves, solar powered lighting and hand made stained glass windows. Within the world treehouse list you'll find a compilation of treehouse stories with all sorts of tree structure from fort to mansion. 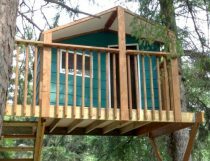 If the thought of preparing your own safe tree house plan is a little daunting, try one of the DIY plans from Treehouse Guides. They include full material and cutting lists, along with diagrams and instructions for the build. Most of the designs fit one or two trees, but there are freestanding options if you want to build with no trees. This option can also be used if you want to incorporate a particular tree into your design, but it is otherwise unsuitable because of its shape or health. If you're on a budget, this simple free plan shows the build process to get started. It can be used as a basic framework for your own plans.